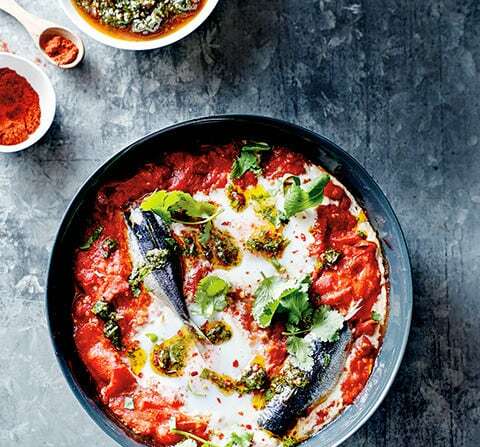 This recipe for baked eggs with sardines is from Pete Evans‘ cookbook Paleo Everyday. Pete has teamed up with Paleo guru Nora Gedgaudas and has become a bit of a love / hate sensation in Australia lately. The had a great TV series The Paleo Way and have been touring Australia doing cooking demonstrations and TV show appearances. Pete’s Facebook page has nearly a million followers so he’s a force to be reckoned with, even if the media love to hate him. This recipe from the book was posted online here. We have the book and enjoy lots of meals from it, though they do take some prep time and the long list of ingredients aren’t always easy to find at the supermarket. Sardines have a fantastic protein profile, heaps of vitamin D, and B12 and selenium. They also have a low insulin load being 50% fat and 50% protein. Sardines are up there with organ meats when it comes to their nutritional profile and a bit more palatable. The base recipe does very well on the nutrient and protein scores, however the net carbs are a little high for a diabetic at 19g per 500 calorie serving. As a reference, Dr Richard Bernstein recommends that type 1s keep their carbs to 6g at breakfast with 12g at lunch and dinner. A diabetic may wish to reduce the number of tomatoes as shown in the analysis below which reduces the net carbs to a much more ideal 12g per 500 calorie serving. With the reduction in tomatoes we get a small drop in the nutrient score from 80 to 73, although the amino acid score increases from 125 to 129. Tomatoes can also be something to watch out for if you have autoimmune issues. Thanks for posting all your recepies and providing so much info. I can appreciate how long it all takes and your passion is evident. Only if the whole world could open their eyes to this. We are getting fatter and sicker, im afraid people just dont seem to care. Am I missing something? Ingredients, nutritional content, yet no mention of cooking times etc.? This is “baked eggs” with sardines, like a quiche, not boiled. Wow, you’re so clever. Sorry I forgot to add. Wow, you;re so clever, jackass. Food Combinations, not recipes. Like saying; here’s a recipe: Liver and onions. This recipe is from Pete Evans’ book (link above) which we have at home but I’m not at liberty to publish on the blog. I try to keep the recipes simple so they don’t need a lot of cooking or instructions. I try to add value wrt which foods are nutrient dense and diabetic friendly rather than writing detailed recipes. Sorry. This one is probably a bit more complex than most of the others. Apologies for that.